Dr Snow’s breakthrough came in the 1854 London cholera epidemic. 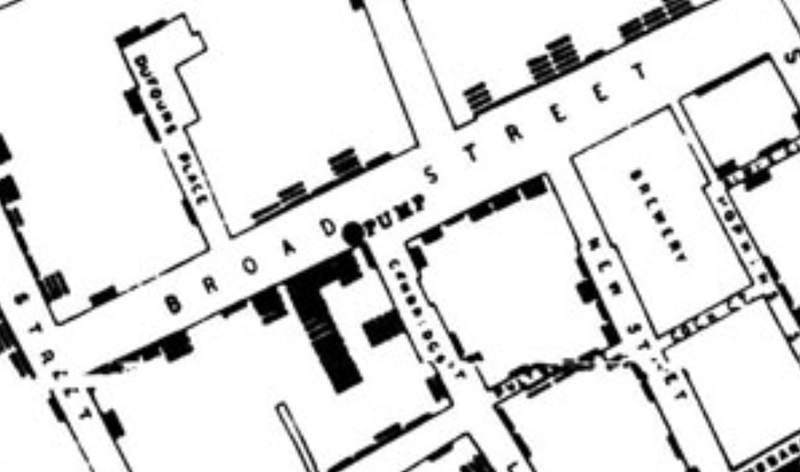 He plotted deaths on a map, and spotted the cluster around a pump in Broad (now Broadwick) Street,W1. Some 500 cholera deaths had occurred within 250 yards of the pump in just 10 days. Yet a mystery remained: ten deaths had occurred closer to another pump. The painstaking Dr Snow found that the victims preferred the taste of the water from the Broad Street pump and sent out for water from there. Finally, he found that a cluster of cholera deaths in Hampstead were explained by water deliveries from Broad Street. 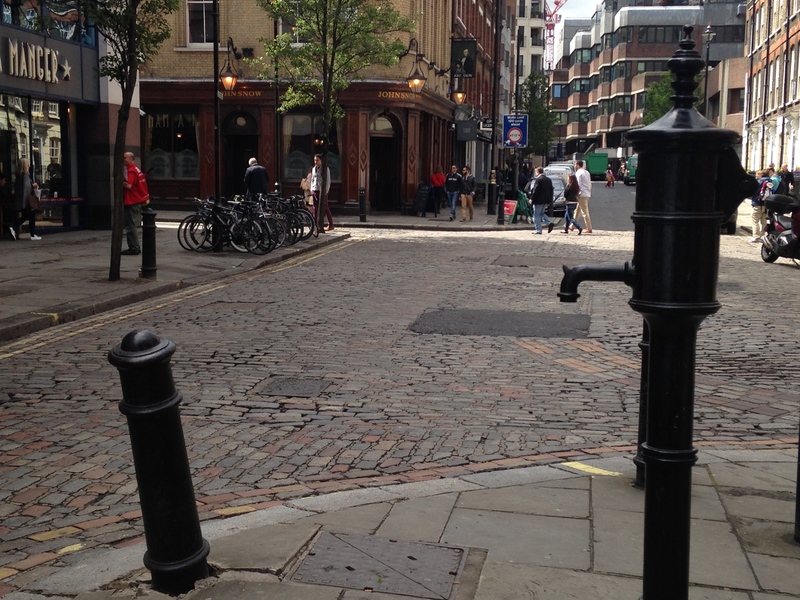 The breakthrough was enough to convince the local authorities to remove the handle from the pump, ending the Soho cholera outbreak. The replica you see today in Broadwick Street has no handle to mark the moment when cholera was defeated. Sadly, it took another four years before the establishment took notice. In 1858, parliament was terrified by the great stink, when the polluted Thames and a long, hot summer combined to make life unbearable for riverside politicians and killing 30,000 Londoners. Parliament gave the go ahead to the historic project led by Joseph Bazalgette to create the world’s greatest system of sewers to keep London safe and healthy. London still relies on Bazalgette’s legacy today. It’s hard to believe that death once stalked the streets of Soho. Let’s raise a glass to the memory of the man who saved countless lives. 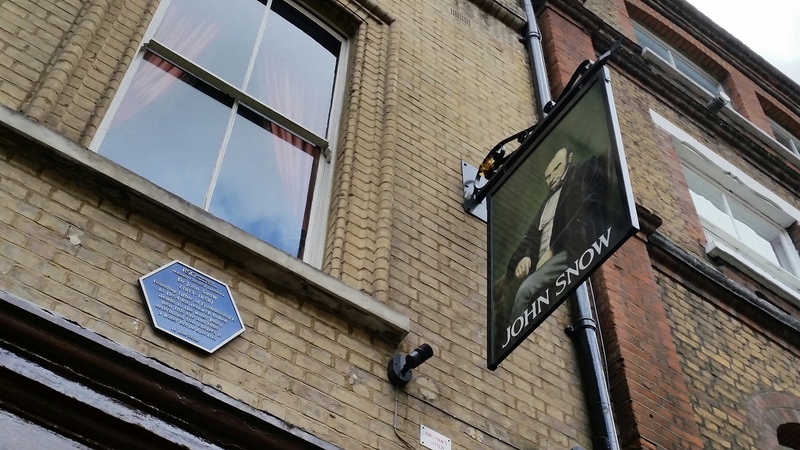 This entry was posted in Health, History, London and tagged Cholera, Dr John Snow, Soho by Rob Skinner. Bookmark the permalink.